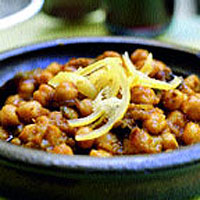 Along with couscous and lentils, chickpeas are fundamental to many of Morocco's dishes. They feature in tagines, couscous dishes, soups and salads, and are the most common pulse in the country. Many local cooks like to slip off their skins so they break down and thicken the sauce or juice of a dish. Hot chickpeas served in paper cones are also a staple street food. Soak the chickpeas in cold water for 24 hours. Drain and place in a pan with a generous covering of cold water. Bring to the boil and simmer for 1½-2 hours until tender. When they are cooked, season with salt and leave to stand for 15 minutes. Drain and reserve the cooking water. Heat half the olive oil in a casserole and fry the onions for 10 minutes, until soft. Add the tomato purée, harissa and garlic and cook for a further 30 minutes over a gentle heat, stirring occasionally. In a separate pan, heat the remaining olive oil and fry the aubergine until nicely browned. Transfer it into the onion pan and cook for about 30 minutes or until the aubergine has softened. Add the chickpeas and whole lemons and moisten with enough of the cooking water to give them a nice wet texture. Simmer for a further 30 minutes and add more salt if required. Remove the lemons and quarter them. Cut out the flesh and discard and cut the rind into strips. Stir the herbs into the pot, scatter with the lemon rind and serve immediately.